Vijay (Sai Dharam Tej) struggles for success. Not just in his career, but also in day-to-day events. He is a talented engineer who has a proposal for a project which he believes will save many lives. Despite his best efforts, he gets nowhere. Amidst his rejections and the taunting neighbours, he finds solace in the form of his father’s encouragement and his girlfriend’s Lahari’s (Kalyani Priyadarshan) love. However, he does lie to Lahari about his alcohol addiction which she absolutely despises. Swecha, Lahari’s cynical friend, advices her to rethink her relationship if it is based on lies. Swecha also happens to be a part of the corporation to which Vijay pitches his project to, and the one who likes his concept. The story which starts with Vijay being questioned in court, unravels to reveal how he ended up there, whether he finds success and if he reunites with his lover. 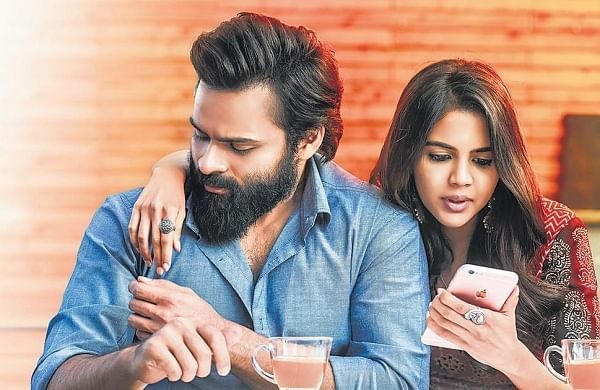 Chitralahari has many interesting points to put forth. It is an honest story with no frills. And that’s what wins. However, it falls a little short on harvesting all the emotion and drama that the characters’ circumstances pack. It only makes you less invested in the characters’ struggles. The effort instead was put in writing one-liners about life, love and genders meant for the audience to relate to, which to be honest was not necessary. What was impressive to me was that, despite the misleading trailer, the film isn’t a triangular love story. The writer doesn’t go down the easy route of adding a romantic angle with Nivetha just because she’s the other female lead in the movie. The relationship between Swecha and Vijay is strictly professional, platonic and significant to the plot. Kalyani played to her strengths with the indecisive, mild-mannered youngster. Same goes for Nivetha who convinces the audience that she is the bosslady you would be afraid of if faced with. Sai Dharam Tej is impressive in a role that isn’t exactly his comfort zone. It really looked like he channeled something of his own into Vijay. It would be delightful to see him work ahead towards improvement, for which there is still scope. The music besides the introduction song (particularly the whistle tune) really doesn’t stay with you nor does it do much for the movie. All in all, the film falls just a tad bit short of being feel-good movie. Whether it was the fact that the emotions weren’t coming through or if it was because there was too much going on in the two-hour run time, is for you to decide. However, it isn’t a bad watch. If you have the time, go for it.